Flathead High School has a new football coach. Defensive coordinator Matt Upham was announced as the new head football coach on Feb. 26 to replace coach Kyle Samson, who left to become a college football coach at Montana Tech in Butte. Coach Upham has been Flathead’s defensive coordinator for the past four years under former head coach Kyle Samson. During Coach Upham’s four years tenure as defensive coordinator, he led the No. 1 ranked defense in 2017 and was ranked in the top five for the 2018 season, which saw the Braves play in the state championship game and lose by just one possession. Coach Upham joined the Flathead Braves staff in the 2014 season. Out of his four years, he helped the Braves to three playoff appearances, including Flathead’s first home playoff game since 2005. Coach Upham’s defense racked up 44 sacks and averaged 3.4 sacks per game last season. Upham has three returning All-State players and two returning All-Conference players. Coach Upham was the quarterback at Helena High. He passed 851 yards, rushed for 709 yards and tallied 18 touchdowns for the Bengals in his senior season in 2008. Coach Upham attended Carroll College, where he played safety. Upham recorded 186 total tackles in his five-year career and helped lead the Saints to a Frontier Conference Championship in 2013. Upham was coached by legendary Coach Mike Van Diest, who had an overall record of 203-54 from 1999-2018. Coach Van Diest won six NAIA National Championships and 14 Frontier Conference championships over 19 years. The Braves will be looking to build upon a rather successful 2018 campaign. About 380 Flathead High School upperclassmen witnessed seniors Rece O’Connell and Olivia Mohatt being crowned prom king and queen on Saturday night, March 16, at the National Guard Armory, north of Kalispell. Feedback of the overall experience was across the spectrum as students both had a good time and others didn’t. Most said they had a god time getting ready, going out for dinner at various restaurants throughout the valley, and then attending the pro. Others said the music wasn’t good to dance to and it felt awkward, until after the king and queen were crowned. After that it seemed that everyone had a good time dancing. Thompson, who is the student body president, spent many hours painting and making decorations. Student council members helped to prepare in the weeks prior to prom, making decorations for the “Hollywood Lights” theme both during school and after hours. Junior Alyssa Habel was in charge of most of the planning for Prom with the assistance of Ms. Michele Paine. “There were many contributors who, thoughtfully made donations towards the success of prom including: Home Depot, Maycon Supply, Bardwood Door and Rentals, Fred’s Appliances, and Midway Rentals,” Habel said. Seniors Max Warnell, Tyler Kluesner, Brett Thompson, Spencer Christy and O’Connell were all nominees for prom king. Candidates form prom queen were Sierra Dilworth, Sadie Wilson, Cassidy Lavin, Kelli Koski, and Mohatt. Times are changing. There have been two school-hour, in-school shootings in the United States already this year--in the first three months. Because of the emotionally-charged aftermath by politicians, activists, citizens, and students regarding school shooting incidents, it is more common for students to experience active shooter drills at school than fire drills. And that’s exactly what’s been going on at Flathead High School. The drills are called run, lock, fight drills and students have been participating in them since last school year. Before the new run, lock, fight policy, Flathead students and teachers would lock themselves in their classroom waiting for the intruder to come in. But, as incidents like the Columbine prove, simply locking yourself into a classroom could lead to easy targets for shooters. So teachers all over the U.S are training differently than before. Flathead teachers first went through the training during spring break in 2016. This year, FHS Assistant Principal Mr. Mark Fischer has implemented planned days when teachers prepare the students for any kind of situation having to do with an intruder in the school. “I do like the new policy because we have more options to choose from rather than lock ourselves in a room,” junior Taelor Owens said. The first option for students and teachers is to run, trying to get out of the building as fast as possible and to get away from the intruder. “I think it’s a really good policy because it gives people more of a chance to live and get away from the intruder, rather than just sitting in a room being massacred,” sophomore Dakota Kempter said. The second option is lock, when students and teachers lock themselves in the classroom, or wherever they are. They barricade the door with any object they can find so the intruder cannot get in. The last option is to fight. If the intruder happens to come in, or comes in contact with teacher or students, they grab anything they can to protect themselves with and fight for their lives. “I think the new policy is much more practical, in a situation where a school shooter was in the school it would seem more realistic to fight,” junior Katie Foster said. Students appear to like the run, lock, fight policy more than the old policy. “I think the new policy is better than sitting in a room praying you won’t get shot,” Chase Ammirata said. Over the past month, Flathead has been fighting off one of their most recent enemies, hackers. All over the world, these hackers have been attempting to hack into the FHS security network over 4.5 million times in January alone. However, these hacks are not totally new to Flathead or School District 5. “In general, schools are becoming a bigger target as many school districts do not have funding to invest in security measures as well as a lack of expertise,” network system admin Jason Hecock said. Hecock has been in the district for 13 years. Last year, as many may recall, there was a cyber attack on school district 5, specifically Columbia Falls. This attack closed down school for multiple days while the hackers infiltrating the system were being booted out. “The issue that happened last year at Columbia Falls was a hack attempt from an outside organization and the way they did that was they scanned IP addresses. [An IP address] is a unique number to every device… An active IP address was found and they started doing what’s called a brute force attack. What that is is there’s hundreds of thousands of attempts at username and password combinations against that particular port that was found open. That particular port and protocol should never be open to the public facing. That was probably human error, I don’t know that for sure but that would be my guess,” Hecock said. This simple possibility of a human error resulted in extreme turmoil for many attendees of Columbia Falls. “It was bad, they had full access to their (Columbia Falls) student information system which includes all of your information from health records that we keep from grades to parent contact information. You name it, it’s in there. They had access to that. So some of the things that we saw come out of that was very personal, very targeted at certain people to get an emotional sense of stress,” Hecock said. Hecock used to work in Montana’s department of administration. “I’ve never seen something like that in my career… From a state level I’ve seen some things but this one was different,” he added. However, this entire incident could’ve been much worse and through it, Hecock has been able to further educate teachers on keeping themselves secure. Taking precautions such as sending fake emails to test out teachers on spying out these fraudulent links. Hecock’s reports show that the amount of times teachers have failed this test has drastically decreased over the duration of time he’s conducted the test. With hacks being hammered down at 159,000 attempts daily on average, it’s easy to see how security must be a number one priority for the school districts. A single open port can result in the most devastating effects, as is evidently clear by the attack at Columbia Falls. Make sure your online connection is secure. Practically everything plugged into an outlet that assists you in the online world has a port. It can be something as simple as a printer all the way to your router itself. Make sure you’re cyber-connected home is private for the safety and security of others as well as yourself. Throughout his season his coaches, Paul Jorgensen, Dan Burfeind, and Jesse Rumsey helped Perrin work on his running strategies. Coach Rumsey, was back to training both boys and girls this year and says that this is the first time in her 18 years of coaching that a runner has been entirely undefeated throughout a season. Rumsey also included that Ben’s brother’s who she also coached, did not have fully undefeated seasons. “He ran faster times than he has ever run in his entire life,” said Coach Rumsey. However, to receive this award it took Perrin a lot of hard work to be the first runner to stay fully undefeated throughout his season. Perrin looks forward to continue running in college. However, he hasn’t made a definite decision on which college he will be attending next fall. Decades of work in America has been undone. In the 1950s, according to a Gallup Poll, 44 percent of Americans smoked cigarettes. Knowledge of its effects, which includes 480,000 deaths per year--the No. 1 preventable killer in America, and the subsequent public advocating for the decrease of cigarette use led to only about 14 percent of Americans who smoke cigarettes today, according to the Center for Disease Control. Tobacco companies were dying and Americans were becoming healthier. But, now, America is going through another similar epidemic that is sure to cripple its population and cost taxpayers millions of medical dollars to deal with in the future. Over the past few years, “JUULing” or “vaping” or using e-cigarettes has become a defiant trend across the nation. The JUUL is a small, sleek-like device that can be easily concealed. Its physical appearance resembles a flash drive, but this little device is holding far worse than computer files. Not only is the device easily hidden, but the exhaled smoke dissipates quickly and smells nothing like cigarette smoke. Some say it smells like a chemical fruit. A JUUL contains “juice” or e-cigarette liquid that comes in a “pod,” or square cartridge, each one containing about 40 milligrams of nicotine per pod, according to the JUUL website. People deem the practice healthy because the cancer-causing burning process doesn’t take place. It is liquid that is vaporized, instead. At Flathead High School alone, Kalispell Police Department School Resource Officer Dennis Bain has issued 30 minor-in-possession citations at the halfway point this school year. Last year, he issued only seven. In other words, FHS students are on track to receive about 60 MIP citations this year, almost nine times as many as last year. The MIP ticket comes with a $155 fine. The stats are easy to understand because the industry’s marketing techniques for the new nicotine addictions identified the young and ignorant minds with fruit or candy flavors and delivery systems that look like trendy gadgets, that creates an illusion that they are safe and without consequences to their health. They often can be resembled to USB flash drives, or common school supplies, like Sharpie pens. Not only do they look cool and taste good, but they are discreet enough so kids can get the natural high of getting away with something. The ironic part about this situation is that e-cigarettes were invented a few years ago to help cigarette smokers stop smoking by giving them an alternative to slowly wean themselves off their addiction. But the product became a trend that non-smokers jumped into. On top of that, the first e-cigarettes contained about 2-3 percent nicotine, but JUUL came into the industry with their 5 percent nicotine pods and took over the lion’s share of the market. And it’s easy to think, when people say that it’s healthy to partake in, there is no mountain of evidence from years of medical research, like we have for smoking cigarettes, because this technology has only been around for a few years. So, the long-term effects are still unknown. Smoking a pod is equivalent to smoking a pack of cigarettes, according to the Business Insider website. “If you’re going to JUUL, you might as well smoke a pack of cigarettes,” said sophomore Hudson Magone. Today, students are using them everywhere: bathrooms, classrooms, cars, or at social events. The practice of, as Brownsville Station put it in 1973 and then Motley Crue again in 1985, Smokin’ In The Boys Room has become so common that many students have joked about it. … And don’t be surprised when another remake of the song becomes popular again. “Change the bathrooms back to bathrooms, not JUUL rooms,” said senior Nick Haas. “Why are there toilets in the JUUL room,” joked junior Lucas Coulter. The entire situation has surprised Mrs. Paine. For many teens it starts out as a social conformity, but then it turns into an addiction. Most students responded with simple phrases like “JUULing is cool” or “I only JUUL because it makes me cool” or “Getting that buzz makes my day” when asked why they do it. Others elaborated a little deeper into the subject. Likewise, other students relate to its normality in students’ lives today. Take public education out of the equation, and some students have a different perspective. Still, most students are grounded in their philosophies regarding their mental and physical state of being. Some blame the mindset of the perpetrators. Two Flathead High School students and one outside student broke into FHS on Saturday Jan. 20. However, the school was not financially affected in any way, for the students broke into the locker rooms and took objects from the lost and found. "They got into the school through an unlocked door," Dennis Bain said. "Luckily the school wasn’t affected and the students who broke in are currently facing charges." FHS students were shocked this happened to the school again, and are becoming even more concerned. "Kids who feel like they need to steal from the school just want the satisfaction of breaking in," senior Angela Denison said. "It makes me mad that people think it's okay to vandalize things and break into places. Just a couple years ago kids trashed the school and they had no right to do that." Senior Isaac Glace agreed with this. "We preach so much about school safety and locking the doors that we actually forgot to act upon what we say," Glace said. "We get comfortable, let some security slide, and boom, just like that some more stuff gets taken from our school. It's ridiculous that the very people who cram safety down our throats, are the very people who leave us open to crime like this. As for the three students who busted in, shame on them for sure, but oddly enough I somewhat thank them for reminding us that we can always get better with our school safety." Since the school has already been broken into twice, students are starting to question their safety and what the school is doing about preventing more break-ins. "I'm glad it was only things from the lost and found stolen," senior Hunter Driear said. "It surprises me that they got in with how secure the school appears to be. It brings me to wonder if the safety measures at the school are simply theatre, or if they are truly functional and keeping us safe." It has also been reported that the schools bullying has been taken to a whole new level, for a student had their property damaged. This incident has bothered many students and staff. "It's completely unnecessary and unacceptable," junior Anja Parmer said. "They were treated poorly and actually had things damaged. I believe that it should be paid for by whoever did it. The school says bullying isn't tolerated, but haven't really done anything to help this student. Additionally, other problems have begun to arise within FHS. The school received a threat from a man, who was not a former student, on Wednesday, Feb. 6. He posted on his Facebook account that if he did not receive mental help, he was either going to shoot up a school, bank, or anywhere for that matter. "He didn't specify what school he would try to shoot up, so we had to be careful," Bain said. "We ended up having officers at every school, and they each knew what type of car he was driving. They soon located him at a business up north, and he wasn't even near a school. This day in age, you just have to be super careful." Students were more than relieved when they found out he was caught. "I think that it's good we caught him, but we should keep a better eye on social media post concerning our school," senior Mackenzie Ramer said. "We must ensure the safety of students and possibly get ahead of the problems." Flathead County’s police Department caught the thief that broke into Flathead High School, over Christmas vacation on Dec. 27, 2018. The thief was caught breaking into many other buildings downtown, which led them into even further investigation. “We had enough circumstantial evidence to connect him to the previous break in,” Dennis Bain said. Though the police have taken him into custody, his name is yet to be released. However, it was confirmed that the thief was not a former students and is in his early thirties. “We can not release his name yet since he is a very well-known person in town,” Bain said. However, FHS students formed their own opinion on the matter. Other FHS students were relieved the thief was caught, and in the custody of police. Flathead sports and activity buses have broken down throughout the state this year. Most notably, the football spirit bus broke down outside of Butte on the way to the state football game in Billings. Changes for traveling across all sports and activities have occurred in part due to necessity out of recent budget cuts. Multiple sports are now required to share buses with glacier including volleyball, wrestling, and boys and girls basketball. Other activities such as speech and debate have had buses so full that coaches had to drive separately. “Its cost efficient if we're sending two buses that are half loaded, so it makes sense to send one,” said Athletic Director Mr. Bryce Wilson. He added that the issue is not strictly related to money instead of the small amount of drivers available this year. “We identified JV and varsity wrestling trips to save money,” said Wilson. This included sharing busses with Glacier. The bus brake downs continued this winter as well on the boys’ basketball team trip to Great Falls that had some unexpected passengers. “The power steering went out on their (Glacier’s) bus and we had to pull in behind them and some of their freshman team got on our bus,” said senior basketball player, Seth Moon. Next year there are major changes coming to the “AA” division of the Montana High School Association. Belgrade High School will be added to the current fourteen AA schools next year followed by an additional Bozeman school that will open in 2020. The changes will be felt throughout all sports, but the most notable for next year will be football. The addition of Belgrade to the Eastern conference next year will move Butte High School back to the Western conference creating unequal numbers with 8 teams in the West and 7 in the East. The uneven conference schedules lead the AA athletic directors to change the format of next year’s playoffs. Teams will only play seven conference games and two on conference games for a total of nine. The first round of the playoffs will be the tenth game and based only on conference schedule meaning the 1 seed in the West would play the 8, the two seed will play the seven and so on. In the East with less teams the 1 seed will have a by against the second Bozeman school, which will not have opened in time for next year. The 8 winning teams who advance will then be reseeded 1-8 using the current strength of schedule format used for the “AA” playoffs previously. 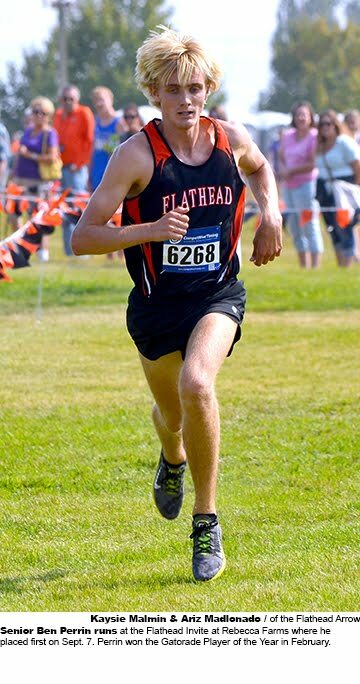 The new teams will also mean a change in competition for all AA schools including Flathead. He added that sports such as football will be a struggle for the teams new to the AA, but Belgrade's volleyball team is expected to be very competitive. Belgrade’s a competitive “A” program and if they keep their numbers up they’ll be fine said, Flathead football team defensive coordinator Matt Upham. The addition of the two teams from the Gallatin Valley will affect Bozeman High who seems to be perennially competitive across the “AA” in every sport. “I’m just excited for more competition,” said junior basketball, volleyball and track athlete. A man with a mask on broke into Flathead High School’s activities office around 3:00 a.m., on Tuesday Dec. 11.
ce it is unclear what the suspect actually looked like. There are no cameras by the activities office, including no alarms, which upset many students and parents. Senior Jasmine Morrison had her own theory on the subject. While other students showed their sympathy towards to school. “I think it’s very disappointing to think someone would do this, especially to a high school,” senior Meghan Fisher said. “But I know this won't go unnoticed and whoever did this will surely get caught. This has made me very upset.”Junior Kennedy Kanter also explained how upset this break in made her. Resource Officer Dennis Bain stated, that even if the school had gotten better footage of the robber, there would still be an unclear view of the male's face. Aside from the office being broken into, there were two cases of theft reported from the locker room, and the dressing room. Teachers and staff push that students continue to use their assigned lockers so there are less cases of theft, and less problems in the locker and dressing rooms. Last year a Tuberculosis outbreak hit the Flathead Valley and most notably, the school district. While Tuberculosis doesn’t seem to be making a comeback another bacteria known as Pertussis is taking its place. Pertussis, more commonly referred to as Whooping Cough, is a bacterial infection that affects the throat and nose. This infection causes its carrier to let out a loud “whoop” sound when they attempt to return air to their lungs after a large and violent cough. This is how it gets its name. Zithromax is an antibiotic that specifically treats diseases like Bronchitis, which has had a minor effect at Flathead compared to Whooping Cough, Pneumonia, various ear and skin infections, and of course Whooping Cough. It is to be noted that Zithromax can be used for other diseases as well that will not be listed. Bronchitis also affected Flathead during the year, while it has not been nearly as prominent. “It affects mostly your nose and your lungs,” Sophomore Parker Stocklin, a victim of Bronchitis, said “The biggest thing about it though is that it clogs up your lungs with mucus…With what I had, I couldn’t really breathe.” While Pertussis has been the main contender of the outbreaks this year, Bronchitis is still a big deal and is potentially life threatening. Four Flathead High School teachers won nearly $5,000 on Tuesday, Nov. 13, from the Kalispell Education Foundation at its grant awards ceremony at Bonjour Bakery & Bistro to enhancing the education of students. Almost $20,000 was awarded to 13 different teachers and organizations in six schools from District 5. High school students will benefit from things like technology advancements in theatre, to introducing a support group for mental health. The four FHS teachers that won grants were Mr. Michael Sherman, Mrs. Marti Paugh, Mrs. Wendy Putzler, and Mr. Mike Kelley. Mr Sherman won $1,000 for Students Assisting Students Support Groups. Mrs. Paugh received $2,000 to set up Southside Coffee. Mrs. Putzler was awarded $856 for the theatre department. And Mr. Kelley was granted $1,109 for a Pursuing the Trades project. Kalispell Education Foundation, or KEF, is a non-profit that has been dedicated to support the efforts of the Kalispell Schools by enhancing the education of students, as it has continued to do over the past 12 years. Mr. Sherman’s support group will foster trust building, and give students an opportunity to give and receive support at school to enhance student academic performance. Mrs. Putzler is excited for the grant in support of the theatre program. Students will be able "try out" or design light and sound plots without being confined to the booth. This would allow all students the chance to design lights. Thirty students of Flathead High school donated a pint of blood to the Red Cross Blood Drive on Thursday, Oct. 6, in the Social Studies Resource Center. With 30 students donating a pint apiece, the total of 30 pints was the most from an FHS blood drive compared to previous years. The collection from last year’s fall blood drive had to be thrown away because of the infestation of bugs in the old gym. According to the 2016 newspaper of the Flathead Arrow, there was 24 pints of blood collected. All together it made this year's blood drive a success. There were a variety of goals for students who donated in the blood drive. For some students, it was the acknowledgement of saving a life by donating their blood. For others, skipping a class in the day was enough inspiration. And for some, to be able to have free food at the end of the draw was enough to get them to donate. “I’m always pumped to give blood; I love it,” senior Hannah Mriss, who has donated blood every time, said. Junior Collin Dallen said that he thinks he will donate more of his blood in the future. Also, he liked the fact that they gave people free food. Homecoming Friday for Flathead High School this year had a little extra spark to it. Students in Mr. Richard Peters’s fourth period woods class were forced to evacuate on Friday, Oct. 5, when a fire started and smoke billowed out of the ventilation system and slowly filled the classroom.The fire alarm did not go off and ceiling sprinklers did not activate. But the Kalispell Fire Department was notified and quickly responded with a truck. “We got some embers off of a machine that got sucked into the vacuum system,” Mr. Peters said. Mr. Peters immediately turned off the ventilation system. If the vacuum had not been turned off, the fire would have spread throughout the entire duct system and been much more threatening. Senior Matthew Johnson was using a sander in the wood shop when he noticed smoke billowing out of the vacuum system. “I used the sander, but I guess I had taken off too much wood, which slowed the sander down, which caused something in the sander to heat up and create a spark,” Johnson said. Students were calm and collected while exiting the building and were patient as they waited for it to be safe to return to class. The fire department used saws to cut into the ventilation duct to get the embers out. Mr. Peters said that this scenario has happened before in his second year of teaching, but it wasn’t as bad as this one. “I called the fire department because we do not have a fire alarm out here,” Mr. Peters said. “The fire department only took about three minutes to respond". No one was harmed in the fire, and it was extinguished before very much damage was caused to the shop. The Flathead High School football team has a new single-season rushing record. With two games left in the regular season, senior running back Blake Counts surpassed 2003 graduate Lex Hilliard's single-season rushing record by running for 217 yards against Great Falls CMR on Oct. 12 at Great Falls's Memorial Stadium. It was his fifth 200-yard rushing game of the season. Now, after two more games to finish the regular season, he posted another 200-yard game and currently has 1,859 yards with 18 rushing touchdowns... with the playoffs looming for the fourth-ranked 7-3 Braves heading into a home playoff game against Billing Senior on Friday. "It felt great; it's a huge accomplishment, not only for me but for the entire Braves team of 2019," Counts said. The 6-foot, 205-pounder has 2,088 yards from scrimmage and 23 total touchdowns so far this year. He has been nominated for Gatorade Player of the Year. Flathead head football coach Kyle Samson said Counts understands blocking schemes and reads players and alignments really well, but "his No. 1 thing that makes him a great runner is his vision and the ability to break tackles," said Coach Samson. Counts gives a lot of the credit to his offensive line. Flathead's offensive line is one of the largest in the state, with all of them being around 6-foot-3 and weighing an average of 252 pounds. "The offensive line is the reason Blake has his success," running backs coach Travis Dean said. "Without the big guys up front, he can’t do his job." Junior center Max Anderson and senior guard Sebastian Koch are the captains of the offensive line. Junior Cole Dalager is the other guard with seniors Patrick Hammond and Andrew Siderius anchoring the tackle positions. But they understand how special Counts is. "As an O lineman, it’s really important to get our blocks, but if you miss one, it’s not that big of a deal because Blake will break the tackles," Anderson said. With quarterback Jaden MacNeil accounting for 993 rushing yards as well, the Braves have a total of 3,021 rushing yards this season as a team thanks to the linemen. "We're just coming together as a family in the huddle," Koch said. "The O line has his back and he’s got our back and we can count on each other to get the job done." Hilliard, a former Montana Grizzly and NFL running back, held the record for the past 18 years with 1,384 yards during his sophomore season in 2000. In 2016, Josh McCracken came close to the record during his senior season. Counts is close to the Class AA state record for rushing yards in a season, which is held by C.M. Russell's Andrew Grinde with 2,180 yards in 2014. The Braves potentially have three more games left in the season, with Friday's first-round game against defending state champion Billing Senior. A first-round victory will probably pit the Braves against No. 2 Billings West in the semifinals on Nov. 9. The state championship will be played on Nov. 16. A new attendance policy took Flathead High School students by storm to start the academic year. Simply put, attendance is now worth 10 percent of a student’s semester grade. After five absences in a class, the grade begins dropping by two percent for every absence after that, up until a cap of 10 percent total. As expected, students have had mixed opinions about it. The incentive comes off as more of a double-edged sword in the eyes of many students. One of the arguments against the policy claims students who could be extremely sick would still come to school in fear of either losing their incentive or losing a percentage of their grades. Nearly all students interviewed agreed that the possibility of an outbreak is just that, a possibility. Whether students like or dislike the new policy, one thing is evident during the first couple months of school: The policy is working. One of the issues at stake at FHS was that 60 percent of freshmen last year earned at least one F on their report cards. Still, others disagree with the policy because of doctor and dentist appointments. Hinchey also expressed frustration as a hockey player. Sports like hockey and baseball are not school-sanctioned sports, so some students were under the impression that their non-school-related activity would hurt their grades. But that is not the case. Community activities like hockey and baseball count as community sponsored absences (as long as you get your absences approved by administration before the events), which do not count against students’ attendance. An observation from School Counselor Mr. Michael Sherman gave further insight on the limitations of the policy and the general emotional feedback students told him. “A lot of students are worried about their grade because they’ll suffer the 10% penalty if they miss the 10 absences,” Sherman said. However, he does agree that it is beneficial to students and the school in the long run. The construction that began last spring after the half floors were torn down has continued throughout the summer and into the current school year. “It began to take shape in Aug with the pouring of concrete and steel (frames) going up,” said Flathead Vice Principal Mr. Lincoln. The construction was most noticeable to students and staff earlier in the year before the new boilers were installed. At that point the school had no heat, which made for some chilly fall mornings inside Flathead High School. “That was terrible I would come in dreading to sit in this seat. I am very thankful that the heat is semi functioning in my class,” said Senior Austin Thomas talking about his second period yearbook class. Junior Abe Otto said everyone in his second period class with Mr. Eversol knew at the beginning of the year if you didn’t bring a jacket you would be cold. Fortunately the boilers were installed in the beginning of October and few days later the heat started working throughout the building. In addition to the cold the smaller hallways and fewer classrooms have taken their toll on the space throughout the high school. Mr. Lincoln described the situation saying we have lost the middle stairways in what used to be the half-floors and senior hall has been shrunk down to accommodate the new construction. This has made getting around the school difficult for some students and the reasons behind it have become disputed among different students. Of the six major ballot issues in the local 2018 election, Flathead High School students’ mock election results lined up with only half of the state of Montana’s real results from Nov. 6. Of FHS’s 1,407 students, 582 participated in the mock election on Wednesday, Oct. 24, in the Social Studies Resource Center. The students voted for all of the Republican candidates, as well as passed all of the initiatives. FHS students were not in line with the statewide Senate race results, nor two ballot measures. They did vote similar to the rest of the state in the House of Representative race and two other ballot measures. In probably the biggest ballot race -- the Senate race between Matt Rosendale, R, and Jon Tester, D -- 52.4 percent of FHS students voted for Rosendale. However, Tester won the real statewide vote 50.1 percent to 47.0 percent. “I’m really happy John Tester won because he was obviously the best candidate,” junior Abby Diaddezio said. While other students were very upset with the results. “I’m disappointed that John Tester won because I believed Matt Rosendale was so much better,” junior Ayden Glencross said. The 2018 midterm election was very important to the nation because of President Donald Trump’s agenda. The Republicans maintained their Senate majority by holding 51 seats, as of Friday at 11:44 a.m. There were still three races across the nation that were too close to call. In the House of Representative race between Greg Gianforte, R, and Kathleen Wiliams, D, FHS students voted along the same lines as the rest of the state, placing Gianforte into office. He secured 63.8 percent of the students’ votes while across the state, 51.1 percent voted for him, according to the New York Times website. The closest ballot measure in the statewide election turned out to be the I-185, to increase taxes on tobacco products to offset the costs of Medicaid. FHS voted to pass the initiative with 59.8 percent vote. However, the state did not pass it, with only 47.1 percent of the population wanting it. “At first I was really shocked that the ballot measure didn’t pass, but then I realized how obvious it was that it wouldn’t have passed anyway,” senior Melissa Gullien said. Ballot measure I-186, which limited new hard rock mining, did not pass with the population only voting for 56 percent. This contradicted the FHS students vote for the ballot measure, with 59.8 percent for it. “I was actually pleasantly surprised that this ballot measure didn’t pass because I also didn’t vote for it,” junior Brielle Hammer. Students lined up to vote either on their own time or during assigned class periods, depending on their last name. This created a real-life experience for young voters, which many students appreciated. However, other students found it very disappointing compared to last years set up. “I believe the mock elections were a lot more unprofessional this year because last year they were very organized, and actually looked like an election ballot,” senior Colter Goss said. Students voted based on many different factors. Some voted based on their parents political opinion, while others voted based on research they had done prior to the elections. Overall mock elections were a success at FHS, leaving students with a similar real-lie experience when it comes for their time to actually vote.